Current: DID THEY BUY IT? HELL YEAH, THEY DID! DID THEY BUY IT? HELL YEAH, THEY DID! HELL YEAH #1, the debut of a new Image Comics series by Joe Keatinge (GLORY) and Andre Szymanowicz has sold out ahead of its release today, March 7. 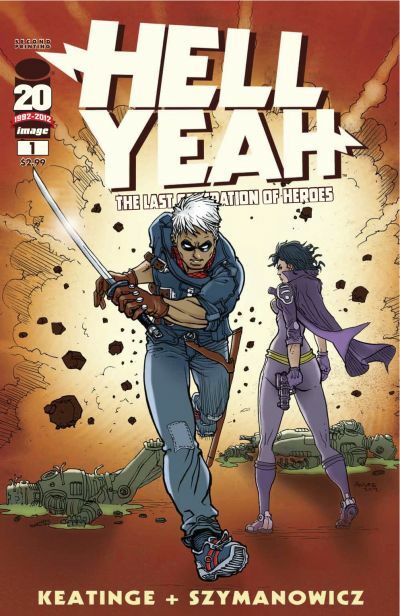 The issue has immediately gone back to press and a second printing (JAN128123) will be in stores on April 4, the same day that HELL YEAH #2 (FEB120507) is released. Keatinge made a splash earlier this year, penning the relaunch of Rob Liefeld’s GLORY (drawn by Ross Campbell), but his own series explores superheroics in a different way. The sons and daughters of superheroes, lost in the shadows cast by the glow of their idealized and idolized parents, have grown up to be just like any kids of rich and famous parents - some of them are rebellious, some of them are spoiled, some of them are overachievers with something to prove. And all of them need to save the world. HELL YEAH is a full-color monthly comic book available in comic book stores and mutliple digital platforms.